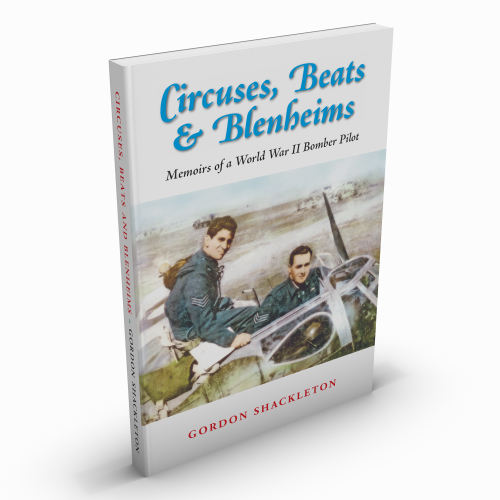 In this entertaining memoir, Gordon Shackleton looks back upon his eventful years as a wartime bomber pilot. He applied to join the Royal Air Force Volunteer Reserve on 5th June 1940, when the Battle of Britain was at its height, hoping to become a glamorous Spitfire or Hurricane pilot, but in the event, after successfully undergoing pilot training and being given an ‘above average’ rating he was posted to West Raynham in Norfolk, to join 114 Squadron, equipped with twin-engined Blenheim light bombers. He began flying operations in September 1941 and went on to clock-up a tour of 29 missions against the enemy, which was no small achievement, for the Blenheim was slow, already outdated and no match for German fighters such as the Messerschmitt 109. As a consequence, losses on Blenheim squadrons were particularly high, with a life expectancy for aircrews of just 5½ hours in the air. In spite of this, Gordon and his two fellow crew members were involved in a variety of missions against the enemy, including ‘circuses’ (during which they acted as ‘bait’ to lure enemy fighters to attack them) and ‘beats’ over the North Sea (looking for and attacking enemy shipping). Other highlights included a successful low-level attack on Herdla aerodrome in Norway, taking part in the two ‘thousand bomber raids’ and locating the German battleships Scharnhorst and Gneisenau after their famous breakout from Brest harbour. This and much more is told with a keen eye for detail and a great sense of humour, and Gordon’s authentic and unexaggerated account is sure to entertain fellow veterans and their families or, for that matter, anyone who takes an interest in World War II history.